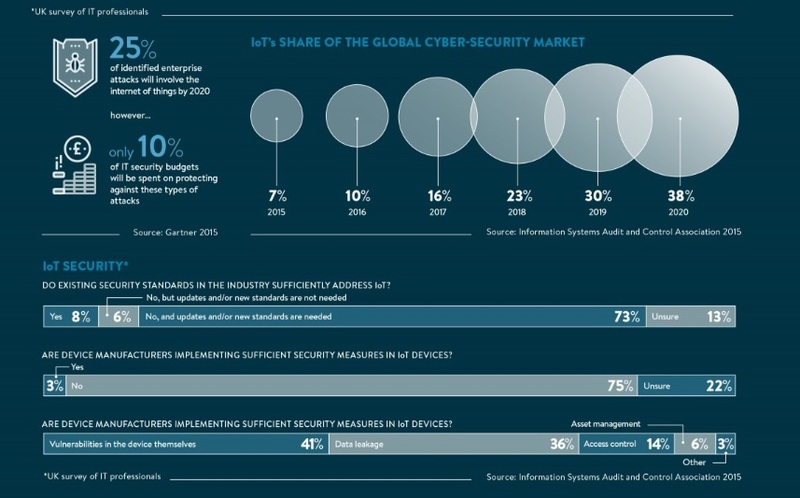 Cybersecurity in the Internet of Things (IoT) is now a hot topic on the Web. In fact, hacker attacks continue to make headlines. This post will show an infographic created by Raconteur that speaks volumes about the lack of professional preparation on the subject. During the weekend of November 26 and 27,2016, hackers attacked San Francisco’s ticket system and held the light-rail system for ransom. MUNI riders were greeted with printed “Out of Service” and “Metro Free” signs on ticket machines on late on Friday and Saturday. These multiple issues raise two types of topic – IT security and trust of users, consumers or professionals. 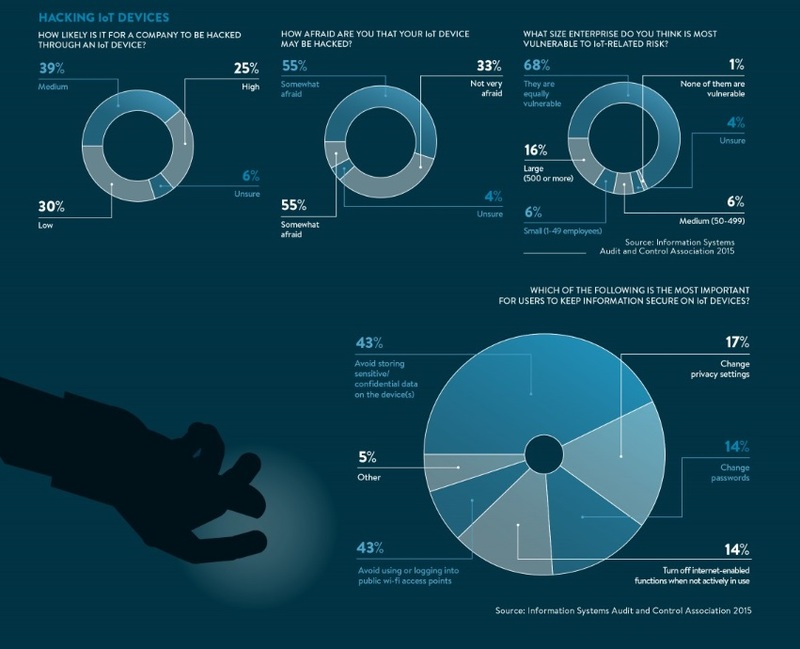 The infographic was published by Raconteur on the challenges of IoT security. The document contains an interesting set of information in the opinion of consumers to corporate efforts to secure the network. First, data from a survey of IT professionals demonstrate an ignorance of the dangers of taking possession of data by a computer striker. 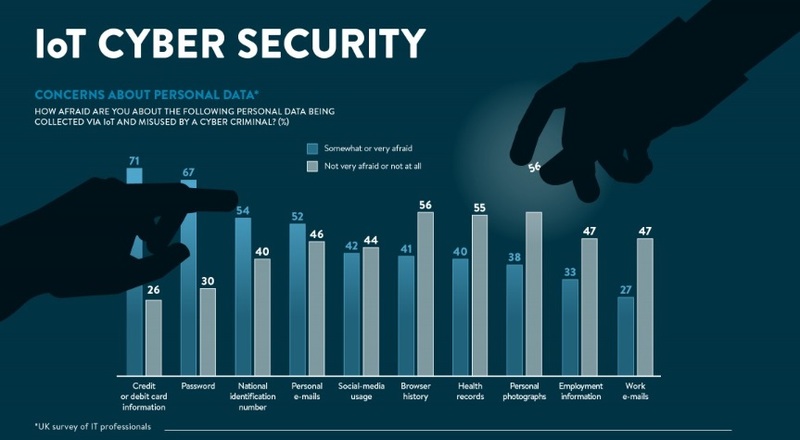 They are 71% to worry about protecting their card identifiers and bank accounts, 67% for their passwords. This percentage is only 54% for identity card data. Similarly, personal emails are not the priority of IT professionals in terms of security. They often packed with critical information on the business of a company. Moreover, cyber security spending such attacks now account for 10% of the turnover of firms by Gartner. At the same time, the market share of security IoT will constantly increasing – it will increase from 10% currently to 38%. According to the survey of IT professionals, 73% of respondents denounce a lack of safety standards for the Internet of Things. Only 3% of them think that the chips and sensor manufacturers dedicated to connected objects implement sufficient measures to protect them from attacks from hackers. Finally, the infographic looks at the chances of being hack from a connected object. 30% believe that the risk is low, while 25% of professionals expecting the worst. However, they are at 68% agreed that the company’s size does not matter in the case of an attack from devices integrating the IoT. To avoid such situations, they advise not to connect the devices to public networks and not to store private data in the internal memory. There is still some way to go on educating IT players not to lose face up to the mountain of connected products that await us in the coming years. Why Do Connected Objects Need the Cloud? Infographic: What Data Do You Need – Big Or Small?